This switch engine was built in 1941 by General Electric, and went through many hands before ending up in Avon, California at Tidewater Oil Company. 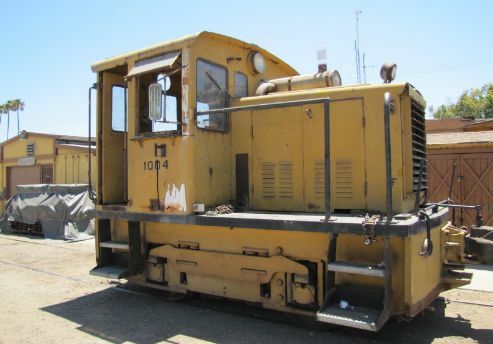 The original diesel and generator were replaced in the 1970’s with a newer diesel engine and generator. The engine was rendered inoperative due to a cracked bell housing between the diesel and the generator. It sat up in the San Francisco Bay area for many years, until it was donated to our Society in 2016. After a general cleanup of the cab, the engine sat idle until enough data was gathered to allow its restoration. With the assistance of a railway preservation website, we were able to obtain the original manual for the engine. We also obtained manuals for the diesel engine and the air compressor. Work has been started on refurbishment of the diesel engine and repair of the cracked bell housing. The hope is to get the engine running by Railfest in April 2018.